COLUMBUS, Ohio (AP) -The Columbus Blue Jackets beat the slumping Los Angeles Kings with an efficient penalty kill and some fortunate breaks. Nikolai Zherdev had a goal and an assist, and Fredrik Norrena made 33 saves to help the Blue Jackets hand the Kings their sixth straight loss, 2-1 on Friday night. 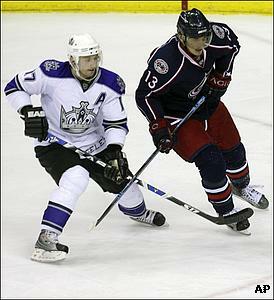 Jiri Novotny also scored for Columbus. The Blue Jackets killed six of seven Los Angeles power plays, had a Kings goal waved off and cleared the puck away from their goal line twice. Norrena allowed only Michael Cammalleri's first-period, power-play goal. "I thought our penalty killers did the job," Columbus coach Ken Hitchcock said. Zherdev broke a tie 37 seconds into the third period, redirecting Ron Hainsey's centering pass from the corner for his 13th goal. "It's about getting people to the front (of the net) and getting pucks in there," said Hainsey, a defenseman who cleared away a sure goal early in the first period. Los Angeles opened the scoring midway through the first period, with Cammalleri's wrist shot going between Norrena's pads. It was Cammalleri's 15th goal of the season and first in eight games. Rob Blake nearly made it 2-0 moments later, but his apparent goal was nullified because he was in the crease before redirecting the puck into the goal. "Unfortunately the breaks went against us," Los Angeles coach Marc Crawford said. "When those things happen, all you can do is just keep working and try to get through it." Norrena kept the Blue Jackets within striking distance in the second period, stopping Lubomir Visnovsky on a 2-on-1 and Ladislav Nagy on a breakaway. "We really relied on our goaltender," Hitchcock said. "He came up big." Curtis Glencross helped, also clearing the puck off the Columbus goal line. A few minutes later on a rare even-strength, Columbus attack, Zherdev slipped a backhander from behind the goal into goalie Jason LaBarbera's pads. Novotny then jammed in the puck from under the goalie with 2:47 left in the period. "There are great penalty killers on this team," Norrena said. "Tonight, we really dug in on the penalty kill and that kind of saved the game." Notes: The Kings have lost five straight road games and are an NHL-worst 4-11-1 on away from home. ... Columbus' Rick Nash has gone a career-high six games without a point.